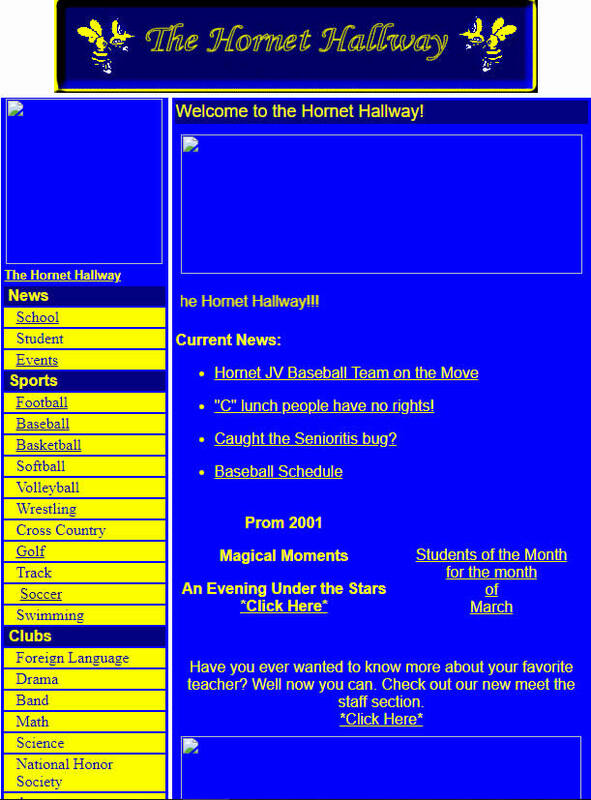 The Hornet Hallway is a student made and student run website that begin in 2001. Prior to that time the "Internet" class was doing simple coding in Microsoft notepad and learning to do web searches and research. That year I purchased a copy of Microsoft FrontPage and we decided to investigate acquiring a domain and a source to host the page. The students discussed and voted for the "HornetHallway" name. Craig Hesson from RCH Networks was a huge help. He stepped up and provided hosting and technical support while we got this project underway. Everyday was a learning experience for the students and me. From 2013-2015 The HornetHallway set dormant due to budget and staffing cuts. In the 2015-16 school year the class was reintroduced and students were recruited to work on the HornetHallway. In the the 2017-18 school year the 3rd period Web Design II class is working on uploading pictures of previous graduating classes. This was the very first layout for the HornetHallway. 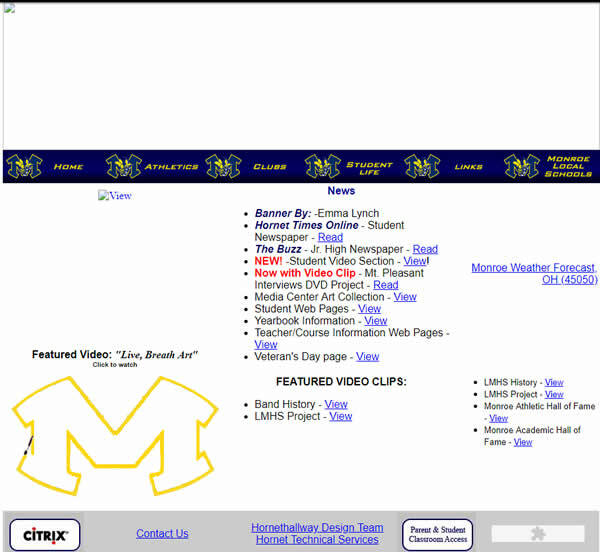 During this time the distirct did not have a comperehensive web page so we ofter provided the coverage for clubs, sports teams, news and other school activities. During this time the distirct was transistioning and adding technoogy. The HornetHallway was often a contact point for student technology resources and links. We were still providing coverage for clubs, sports teams, news and other school activities.